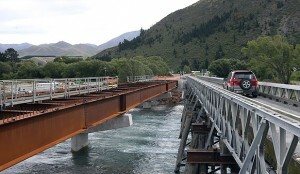 New Zealand’s Waitaki Bridges are undergoing major changes in order to put to rest doubts the bridges could withstand another flood season. The 132-year-old single-lane wooden bridges will be replaced by two-double lane bridges, made from weathering steel – a high strength, low-alloy steel that forms a weathered, rusty look. According to Steve Proud, The New Zealand Transport Agency’s Waitaki Bridges project manager, the $201 million renovation is well underway with a few projects already completed. Proud believes that by going with weathered steel they are reflecting the heritage of existing bridges while also drastically improving safety.